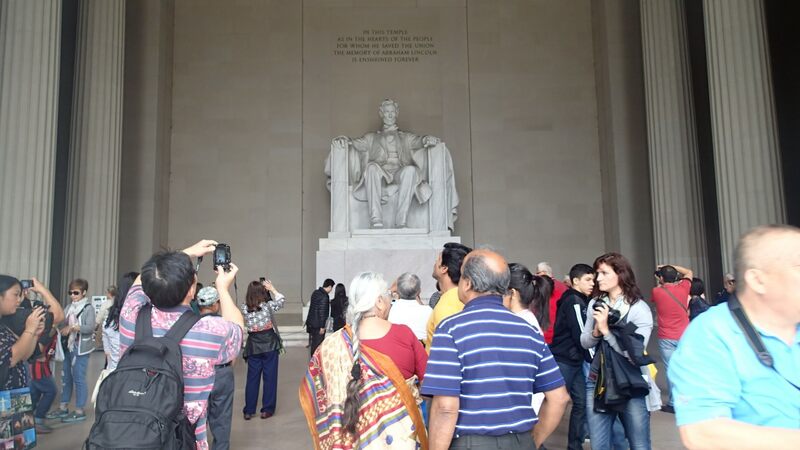 10 Things You Need to Know Before You Visit Washington D.C.
Back in October of 2014, my younger sisters and our uncle took a week long trip to Washington D.C. to visit all the war memorials. Since my uncle has a heart condition, we decided to rent an SUV and drive to Washington D.C. from Madison, Wisconsin instead of flying. Even though I did a lot of research beforehand and planned out as much as I could, there were a few hiccups during our trip that could have been avoided if I knew a few extra things. As such, I’m here today on my WordPress blog to share with you the top 10 things you need to know before you visit Washington D.C. so that you can avoid unnecessary headaches during your trip. 1. 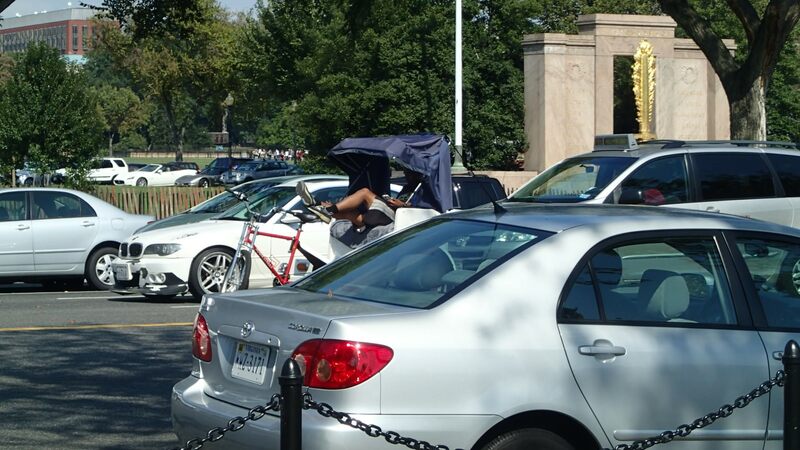 Washington D.C. residents are rude. At first, I really thought that I had a negative attitude towards D.C. but after discovering that Travel + Leisure rated Washington D.C. as the third rudest city in America, I know it isn’t just me. 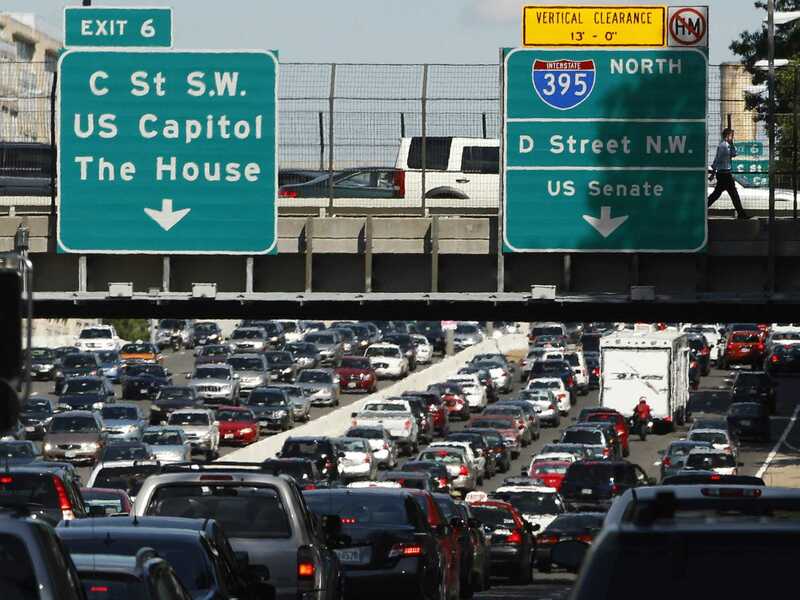 Washington D.C. drivers drive like there are no pedestrians and pedestrians walk around like there are no such things as moving vehicles. Make sure you’ve got enough car rental insurance and that you’ve paid last month’s medical insurance bill because residents of Washington D.C. could give two licks if you’re trying to walk across the street (even when you’ve got the walk signal) or attempting to merge into a lane (with your signal on) because D.C. residents need to get where they’re going NOW. 2. Your cell phone carrier will make or break your trip. If you’re with a cell phone company that has slow 4G LTE coverage (Sprint, I’m looking at you), you’re going to find your Google Maps losing signal on one of the busiest highways … in the middle of rush hour. Also, you’re not going to be able to pull up TripAdvisor as quickly or as often you would like because the slow cellular data you’re using is also draining your battery (which is going to limit how many photos or videos you can take). Word to the wise, figure out what your data coverage is going to be like while you’re in D.C. so you can route your trips or plan attraction visits ahead of time because of your craptacular data coverage. 3. Stay outside of Washington D.C.
Hotels in Washington D.C. are ridiculously expensive for the average tourist. Who wants to spend upwards of $150 a night on a room that you’re barely going to be in? To avoid paying for parking and other amenities you might otherwise expect to be free, stay in a hotel outside of Washington D.C. Many hotels in surrounding cities offer shuttles to Washington D.C. and are even located near public transportation that can take you to Washington D.C. quickly. We stayed in a hotel in Alexandria, Virginia for a 4 days and spent less than $800 on a 2 bed suite (with free breakfast and parking). We decided to stay in Arlington because it’s only a 15 minute car ride from the hotel to the heart of most of the tourist attractions. Also, I liked the fact that we could escape the chaos that is D.C. at the end of the day. Trust me, after a day of shuffling around other tourist and traffic, you’re going to want to get away from it all. Taken on a Monday afternoon. I couldn’t get a clean shot of President Lincoln. I found TripAdvisor to be especially helpful because the site/app offered real time member reviews. I was able to narrow down attractions we wanted to visit and plan our days around those sites. If you’ve got a few days, devote one day to the White House, war memorials, Lincoln Memorial, Lincoln Memorial Pool and Washington Monument because they’re all within a five minute walk of each other. Then spend the day at the Arlington Cemetery and visit the Marine Corps War Memorial at the end of the day. Plan on devoting another day to the Smithsonian Museums because they’re amazing (and free to visit). If you can, avoid major tourist attractions during peak hours. Avoid Chinatown because it’s nothing more than a arch way and a block or so of mediocre Chinese restaurants mixed with western stores like Walgreen’s. Trust me, it’s not worth the effort it takes to get there. Thinking maybe the Chinese restaurants were hidden gems, my family and I took a chance and dined at New Big Wong Chinese Restaurant. Big mistake, we couldn’t finish our meal because the dishes were saturated in heavy, bland sauces. My garlic eggplant dish had more sauce than it did eggplant. 6. Be prepared to spend top dollar on parking if you don’t want to take public transit. If you’re like me and decided to rent a vehicle to get you to Washington D.C., be prepared to pay top dollar for parking on the streets and in parking ramps. If you want to avoid paying these fees, read up on Washington D.C.’s public transportation. According to many other travel blogs and friends who live in D.C., public transportation is the way to go. If you have to drive, there is free parking on streets by the war memorials but you’re only allowed to park for 3 hours at a time and have to remove your vehicle by 4 PM to make room for rush hour. $23 for 2 hours of parking in a parking ramp near Chinatown. $25 for an afternoon’s worth of parking in a parking ramp near the Smithsonian Museums. $5.25 for an afternoon’s worth of parking at Arlington Cemetery. $2.50 for 2 hours worth of parking in a parking ramp in Arlington, VA.
$7 for a mile and a half ride taxi ride. 7. If you don’t have time to see all the major tourist sites in D.C., buy a ticket up to the top of the Washington Monument. For $1.50, you can easily view all the major tourist attractions in the heart of D.C. from the top of the Washington Monument in minutes instead of hours. The National Park Service offers daily tours, from 9 AM to 5 PM. If you know you’re going to be in D.C. for sure on a certain day and time, you can buy your tickets way in advance. 8. Don’t waste your time and money on bus tours. One thing I observed while walking around Washington D.C. is that buses get stuck in traffic just like everyone else. There is no special lane for tour buses. Now, if you’re really lazy and want someone to plan your day for you, go ahead and sign up for bus tours but if you’re like me and want more control of where you go and when you go, save yourself some money and just go on self-guided tours. Pedicab driver waiting for President Obama to pass through. 9. Traffic stops when President Obama leaves the White House. Yep, it’s true. 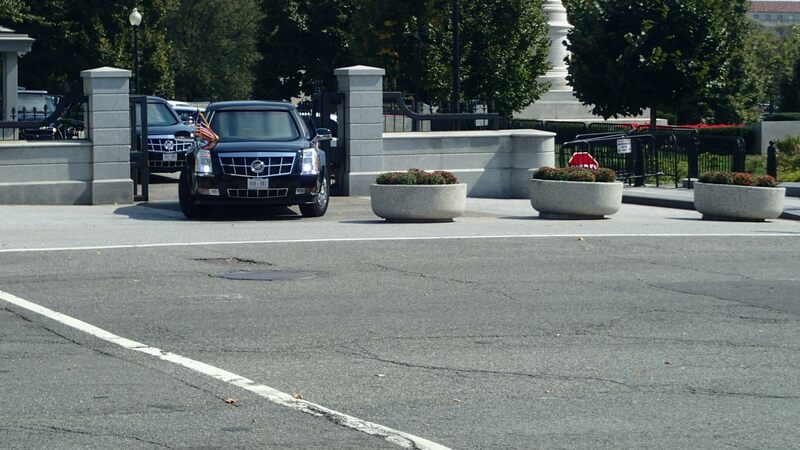 When President Obama leaves the White House, traffic is stopped and blocked until President Obama (and his motorcade of secret service) pass by. Did you know President Obama has his own ambulance follow him around?!? President Obama leaving the White House! On our second day in the city, just as we were walking away from our visit to the White House and towards Constitutional Avenue, we noticed that traffic had been cleared and there was security everywhere. Curious (and because security wouldn’t allow anyone to even cross the street), we watched a limousine with the Presidential Seal on it depart from the White House security gate. Of course we just stood there in awe and snapped pictures along with every other tourist. 10. Last minute souvenir gifts of t-shirts are easy and cheap to come by. If you’re like my younger sister who waited until the last day to get souvenir gifts for people, you’ll be incredibly grateful for the street vendors parked along and near Constitutional Boulevard who sell t-shirts for dirt cheap up until 6 PM or so. The street vendor we stopped at (right by the White House) sold his t-shirts for $5-$10 each. If you’re looking for more personal and elegant gifts, I suggest you visit the Smithsonian Museum gift shops. If you’re looking for a gift for a war veteran, I highly recommend the small gift and coffee shop located along Constitutional Blvd, near the Vietnam War Memorial. Planning trip to Washington D.C.Travel tips for Washington D.C.Visiting Washington D.C.Washington D.C. Interesting leisure read. Thumbs up!